battle against PTS. ​Click on the "more info" buttons by each page you're interested in, then scroll further down for more info. 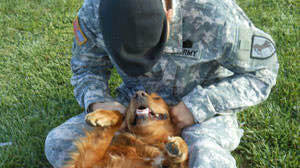 Using the healing power of dogs in the fight against post traumatic stress. ​ it's like to live with a service dog. 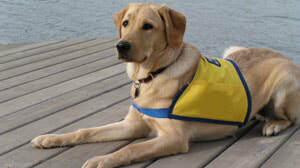 ​different types of assistance dogs. of the oldest forms of alternative therapy. Add a dog to the mix & you have magic! A lengthy list of things to consdier when you're looking to get a service dog. 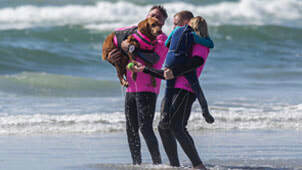 This page explains what emotional support dogs are, as well as the laws regarding them. 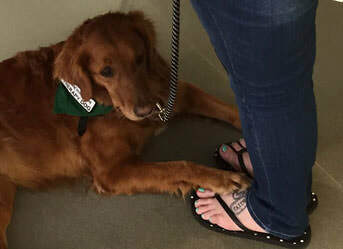 Blog entry that explains what it's like to be partnered with a service dog. 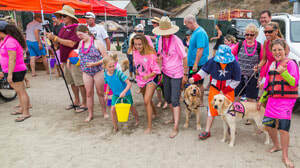 ​Ricochet has a mystifying ability to make immediate connections with strangers both in and out of the water. Information and registration to participate in one of our events. 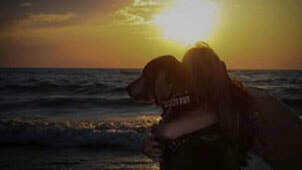 This page explains what PTSD dogs are, as well as the laws regarding them. ​ are, as well as the laws regarding them. 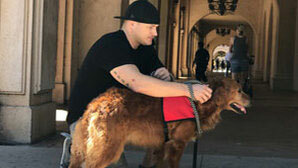 ​go to college with a service dog. 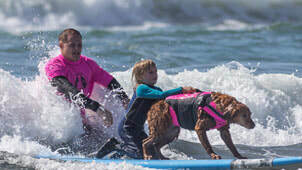 Canine-assisted playing is a unique camaraderie between kids, people with disabilities, veterans & our dogs. ​as a guest at one of our events. PTS is a mental health condition that is triggered by a terrifying event that results in psychological trauma. It is considered an invisible disability. Roughly 20% of the nearly 2 million soldiers who have served in Iraq & Afghanistan are struggling with PTS and TBI. Their families are struggling right along with them. When they return from war, they come back a different person, and are forever changed. Their soul is shattered. They are broken. Post-deployment suicides cause more deaths than combat! Studies show that 1 in 5 veterans returning from Iraq and Afghanistan have PTS. Twenty-two veterans take their lives every day with over 600,000 living with psychological trauma from the war. Some veterans can make a relatively easy transition to civilian life. But many find it much more challenging and overwhelming. The world they knew prior to deployment no longer exists for them. They now have a hard time functioning in day-to-day activities, and find themselves looking at most things as potential threats. They can be easily startled, triggered by sights, sounds and smells that remind them of war. They often succumb to homelessness, crime, drugs and alcohol. The hyper-vigilance and hyper-reactivity they needed to survive at war, is no longer appropriate in our society, but they often respond with a fight or flight reaction. ​They experience depression, memory loss, rage, severe anxiety, impatience, numbing, avoidance, uncontrollable thoughts, fear of public places and panic attacks. They often end up living very secluded lives. Relationships with their spouse, family and friends can break down. They suffer from hallucinations, flashbacks, nightmares, night terrors, lack of sleep, insomnia, isolation, lack of confidence, self destruction, suicidal thoughts and depression. They have a distorted sense of reality and often find themselves in a self destructive downward spiral of inappropriate emotional responses to everyday situations. 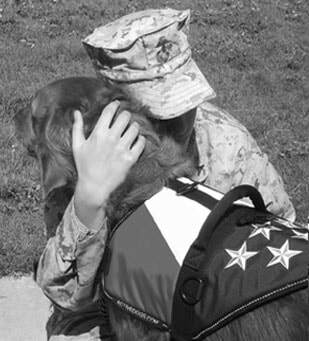 PTSD service dogs can help reduce anxiety and re-establish a sense of security. 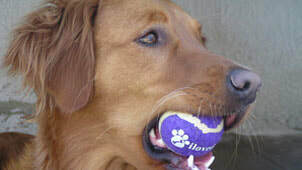 Very often the dog provides enough help that the person can reduce the amount of medications they take. 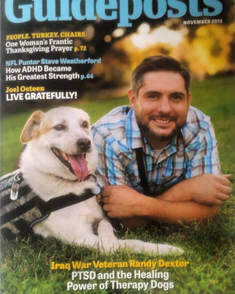 Veterans who have service dogs say their symptoms are greatly reduced and their lives have been transformed. ​Our mission is to educate the general public about the signs & symptoms of PTS, combat stress, MST, TBI and other combat related injuries. Our goal is to provide resources, support and hope to individuals and families dealing with PTS, and to showcase the healing power of dogs. 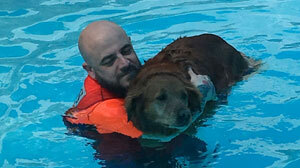 We also help people understand the differences between emotional support dogs and service dogs. ​We hope to provide a platform of possibility as you are spun into a cocoon of positive energy and healing to fight PTS. Ricochet can help you without judgement or intention to change. Please be sure to visit our other pages that have additional videos and info on dogs and PTS. ​​​Upon returning from combat, many service members suffer from PTS, traumatic brain injuries (TBI) and Military Sexual Trauma (MST). ​They are burdened with depression, anxiety, hypervigilance, torturous flashbacks, triggers, sleepless nights, vivid nightmares, traumatic memories, isolation, hyper arousal, anger, self-medication, self-destructive behavior, alcoholism, a profound and enduring sense of hopelessness and a host of other symptoms that often push them to the brink of suicide. Veterans with combat PTS find it difficult to maintain relationships in a civilian environment, and their personal lives suffer. They often find themselves alone, jobless, homeless with little hope for the future. ​The transition from service member to veteran can leave many with no sense of purpose after having such crucial jobs in the military. The connectedness they felt with their military brothers and sisters now gives way to feelings of disconnect. ​and leadership abilities, which give them a renewed sense of purpose. ​When a service member with PTS returns from the battle field they are often hypervigilant of the environment around them. An empty grocery bag on the side of the road could stir up memories of IED’s and cause a break-down. They often sit with their back to the wall in order to see everything that is happening around them. 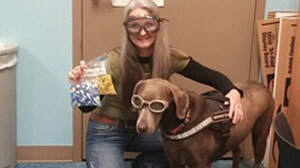 Ricochet helps these individuals learn to trust again. She gives them a sense of safety that they lost in the combat zone. They can bury their head in her fur and talk to her without being judged. Many clinicians try to get them to function in our world again. But a veteran with PTS may never be able to go back to the same person they were prior to the horror of combat. Ricochet doesn’t have those expectations. Instead, she goes into their world. She is able to draw out even the most isolated individuals and help them overcome emotional numbness. ​This service member is sitting with his back to the door. Ricochet chose to lay behind him to see what he can't see. Although she's lying down, she is aware of the environment. She continuously touches his hand to let him know she's there, and "has his back". If something were to change in the environment, her behavior would change to let him know, such as standing up. This reduces the service member's anxiety. Dogs are hypervigilant by nature. As long as the service member pays attention to the dog, they can let their guard down like this service member was able to do. 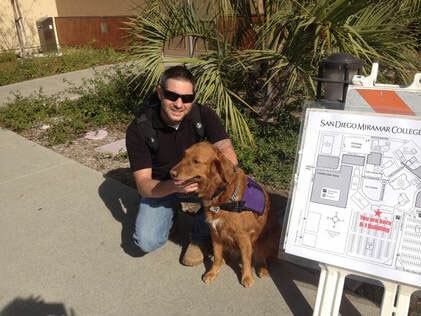 ​Some people may think Ricochet is too far away from her service member with PTS. Some may think she's in the way of the entrance. But what she is doing while the service member is talking to the person at the counter is... Having his back. She watches what is going on behind him. She is at the end of her leash to give him more personal space. The dogs in this program aren't taught to do these things. They just know. All dogs know. We just have to listen to them & trust them. Often people think their dogs are misbehaving, but they are really just trying to tell them something. ​​This was Ricochet with her sailor at the Apple store today. She is lying under the display table to be out of the way, but still facing forward so she can "have her sailor's back" while she looks at computers. 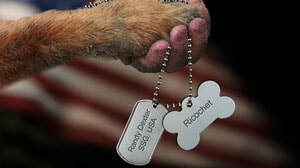 ​If you notice, Ricochet has her paw on the service member's foot to maintain the connection. Every 65 minutes a veteran with PTS takes their life by suicide. That’s 22 lives a day! Studies estimate that 1 in every 5 military personnel returning from Iraq and Afghanistan has PTS. More than 31% of veterans from the Iraqi and Afghanistan war meet criteria for a mental illness. 20% of the soldiers who’ve been deployed in the past 6 years have PTS. That’s over 300,000. 17% of combat troops are women; 71% of female military personnel develop PTS due to sexual assault within the ranks. One in three combat troops report symptoms of PTS, but only about 40% seek help. improve the lives of our physically and emotionally wounded war heroes. 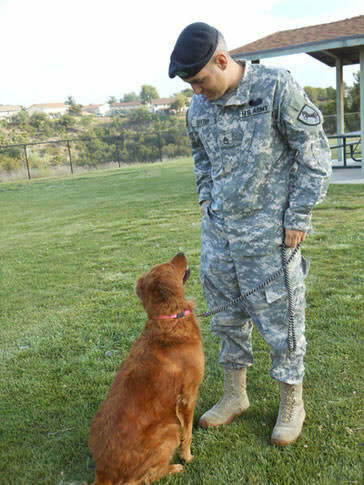 ​One of the soldiers that Ricochet worked with in the six-week Paws'itive Teams Canine-inspired Community Reintegration therapy dog program was Staff Sergeant Randall Dexter. When Ricochet met him, he was suicidal. When the six week sessions ended, she continued working with him. She accompanied him to school, and was there whenever he needed her. 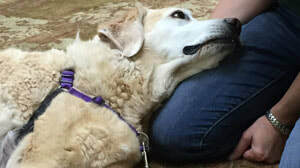 Since Ricochet was already trained as a service dog, and our Executive Director, Judy Fridono has a degree in service dog training, we used our background, knowledge and skills to help Randy (and some other service members) on a short term, intermittent basis as he continued his recovery and re-integrated back into the civilian world. 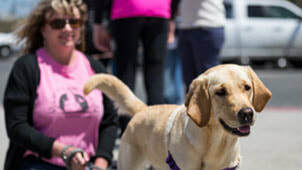 ​Our goal was for him to feel comfortable in public, regain his independence and accomplish his personal aspirations while learning more about service dog training. We taught him additional tasks that service dogs perform to mitigate a PTS disability which include alerting him to an early onset of a panic attack so he’s not caught off guard & can take appropriate action. How to position Ricochet in front of, or behind him on his verbal cue to create a barrier between him and a perceived threat. To cue Ricochet to stand in heel position, but facing backwards so she can alert to anything that is happening behind him. Utilize her to provide stimulation to distract him from emotional overload by responding to a cue to lick his face. ​​If Randy wasn't sure if his responses to certain situations were appropriate, he looked to Ricochet for confirmation. If she was calm, and not responding to whatever he heard or saw, he knew everything was ok. The most important factor of this training was learning how to interpret Ricochet's body language and other cues to reduce his hypervigilance. We also taught Randy the importance of a service dog's temperament which includes being laid back, amiable and well socialized so they can handle the challenges of public access work in a calm manner. We showed him how Ricochet can remain obedient and unobtrusive even if he reacts with extreme anxiety to various stimuli. By remaining calm in such situations, Ricochet's relaxed demeanor served as a reality check for Randy and enabled him to more accurately assess the situation and make reality informed decisions about what to do. 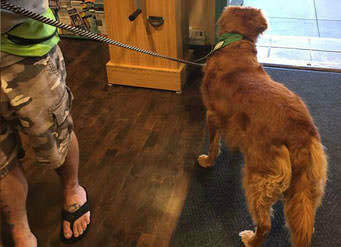 ​In addition, we highlighted how important it is to determine if a dog is appropriate for 24/7, high anxiety PTS work. The dog's well being is of utmost importance, as not every dog can handle such stressful work. ​There were many times I saw Randy at his worst. There were many times he felt defeated. But he listened to my advice about not rushing to get just any service dog out of desperation. 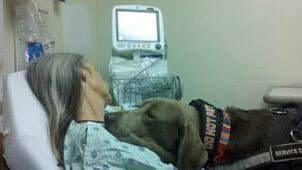 He did everything right on his service dog journey. 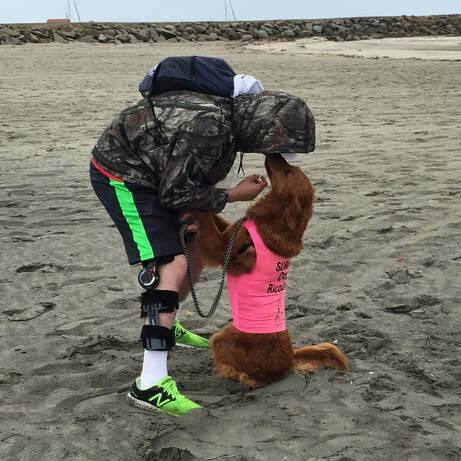 After about a year, Ricochet raised $10,000 so he could get his own service dog. His dog, Captain is from K9's for Warriors. Randy is now a college graduate, accomplished public speaker and the Campus Director for K9's for Warriors. He came full circle!